LeBron James, Dan Gilbert: Can LeBron forget the Cavaliers owner’s crazy, Comic Sans letter? Should he? Can LeBron James forget Cavaliers owner Dan Gilbert’s letter? Should he? I’m going to take my talents … somewhere. 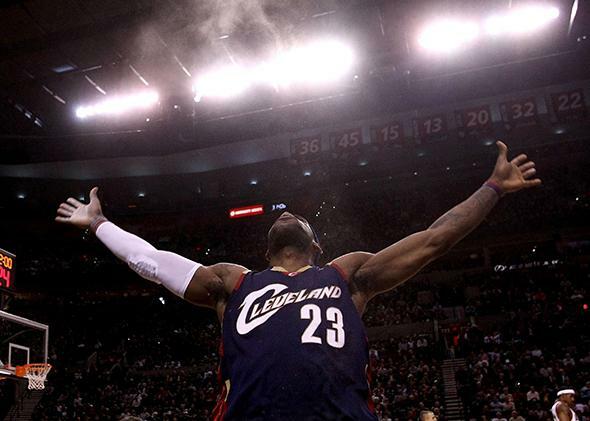 Update, July 11, 2014: It’s official: LeBron James is returning to Cleveland. In matters such as these, I often turn to my colleague Emily Yoffe, aka Slate’s Dear Prudence columnist. I asked Prudie how she would advise someone who, in general terms, had a great opportunity to go back home and work for his former company. The only potential pitfall was that this man’s former boss was an enormous jerk who had demeaned him publicly and privately. Prudie wondered if it might be possible for this employee to move to a satellite office after three months (the D-League’s Canton Charge? ), or if maybe the boss was a short-timer. I said there was no chance of either of these things happening. These two would be stuck together for a good long time. The best analogy here is to a marriage that ends in an acrimonious divorce. At the very end, things are said or written in anger, things that you don’t really mean, and in fonts that no one should ever use. But there are also underlying reasons for the breakup, patterns of behavior that must be changed for these two people to be civil with each other or—in certain extraordinary circumstances—take the plunge and get back together. Though James is the one who supposedly “betrayed” Cleveland, in this instance he’ll be the one with trust issues. For the Cavaliers, re-signing LeBron would be an amazing coup. The team would be an instant championship contender, and Gilbert’s coffers would spill over with added revenue. Cha-King! Just as important, James would have to go in to business with someone who’d behaved as if his move to Miami in free agency had been a betrayal on the order of surrendering West Point to the British. And this someone still seems to believe that fanning the flames of LeBron hatred was the right thing to do. During our conversation, Prudie noted that as a general rule, it’s good to “get out of horribly dysfunctional relationships, and don’t go back.” Then again, if LeBron really does want to return to Cleveland, then he’d be shortchanging his own happiness if he decides to stay away just to spite Dan Gilbert. There are no easy answers here, which reveals the absurdity of all of the talk that LeBron is in an unusually powerful position, able to dictate where he wants to go and under what circumstances. The likely reality is that he’s grappling with a pair of imperfect choices, both of which would require him to cede control to a higher, richer power. Does he believe that Heat President Pat Riley and owner Micky Arison can retool an aging roster? Does he think that Miami is where he wants to spend the dwindling prime years of his career? Does he trust that Dan Gilbert will control his worst impulses, and that Cleveland general manager David Griffin can solidify the team’s young core? Does he believe that the value of returning home and winning a championship in Cleveland exceeds anything else he could possibly achieve in the NBA? The whole point of free agency is that you’re free to go wherever you like, for whatever reasons you feel are most important. Going to a new team isn’t a betrayal, and it isn’t an act of cowardice. It’s simply a decision, whether televised or not, that you make after thinking through the pros and cons. If it were me, “Owner wrote an insane note in a weird font that deemed me a blight on humanity” would get a prominent place in the con column. But it’s not my list, and my opinion doesn’t matter. If LeBron wants to get hitched to Dan Gilbert once again, I’ll wish him well. I just hope they get some counseling, because nobody deserves to see this again.